Thank you RedKetchup for letting me know. OK, so I will create Sand, Clay, and Bricks. I will not create glass because there is a limit of 3 types of resources per building. The sand will come from a shore-side building and the clay will come from a clay quarry (though neither will ever run out of resources). The brick kiln will take a lot of sand and clay and a tiny bit of iron to make bricks. One variant (the one with a sloped wood roof) of row houses will use 25 logs, 40 bricks, and 10 steel tools. Another variant (one that will look most like the picture I posted) will use 20 logs, 50 bricks, and 10 steel tools. After close inspection of the housing in banished (particularly the stone and colonial houses), I will make my row houses 2x4 tiles plus street access (so exactly half the width of the stone and wood houses) but have the same capacity as regular houses (8 people). I will have both be as warm as the colonial manor and use half as much firewood as a stone house, which is 1/3 as much firewood as a wood house. I found out that warmth and fuel consumption are two different variables. I guess the glass windows will just be freebies because my brick row houses will have glass windows and be very warm and energy efficient and there is no way to make buildings require 4 resources. I hope that my row houses will be properly balanced because I don't want them to be too overpowered for difficulty it takes to construct them. I might increase the amount of bricks needed to build them but once a brick kiln is set up and a blacksmith is set up (and plenty of coal and iron are either mined or bought), it should be a more economical choice to build the brick row houses. I have one question though, is there a way for a manufacturing process in banished to make more than one unit of a resource at a time? I want 1 iron + 30 sand + 50 clay to make 10 bricks. If that is not possible, I could just make the brick unit be a bundle of 10 bricks, make bricks super expensive to make (but still only use 1 iron because bricks only have a tiny amount of iron), and cut the amount of bricks needed to build houses to be 1/10 (so the brick row houses would use 3 to 5 brick units). It would also make bricks heavier (so banished townsfolk could only carry 1 unit of bricks at a time) and make the brick kiln take longer to make bricks. I agree with @RedKetchup. Tools already get used up when the little people work. The number of an item made in one operation is in its template file. For instance, the following lines say that between 1 and 2 of this item will be made in one operation. Is the "three materials" rule on a per building basis or is it global for the town? If @AzemOcram sets, for example, clay, sand and bricks as the material for his tenements, does that effect only the tenements or does every building in town have to be made from clay, sand and/or bricks? I've never quite understood how this works. I am sure that it is a per building resource because in Colonial Charter, the colonial buildings required logs, stone, and rope while the normal houses still used logs, stone and iron. I will use clay and sand to make bricks but the row houses will be made of brick, logs, and iron (or steel tools for greater difficulty). Sand was used in bricks starting around 1650 or so and most bricks made today have sand. Bricks made with clay, sand, and iron are stronger and lighter than stone. I just looked it up and bricks made during the industrial era were mostly clay, with roughly 1/3 sand and a tiny bit of iron. I just realized that brick kilns require some sort of fuel to fire the bricks. I will see whether wood fuel was ever used, otherwise bricks will require coal just to stoke the fire to cure them. I guess I could have the row houses require glass as a building material and have them take many building turns to be built. Thank you everyone for the input and I will be sure to start work on modding as soon as I get back onto my main computer when I come back from my vacation. EDIT: Do you think it would be better to have the brick kiln manufacture the bricks from raw resources in addition to firing them or do you think I should have a brick maker (that makes raw bricks) and have a kiln take raw bricks and make them into completed bricks? If I go with the second option, I might find a way to add pottery in the game, if I can find a way to have bonus resources increase happiness. Never mind, I think I will have the brick making structure look like a Bull's Trench Kiln, which is large enough to make bricks from raw materials and fire them all in the same building. This building would only make bricks. Wikipedia says that bricks use about 50-60% sand, 25-30% clay, and 5-7% iron. That means I will have 20 bricks made for every 50 sand, 30 clay, and 5 iron. Does that sound balanced? thats where i ve check wikipedia, and i never saw talking about sand, but i maybe misread. but it s your mod man, you do as you want ! <= which is the most important. edit : oh ok, i see , in industrial era. btw i thought about something else too. where do you plan to stock those ? on a stockpile ? barn ? cause..... i think some material like firewood, stones, irons, have some extra 3D files used to make 'visual' piles on the stockpiles. Looks like Colonial Charter: Iron Curtain beat me at adding bricks first. That means that I will most likely not publish my mod and make my Rowhouses dependant on Colonial Charter. I really don't want to compete with a mod I already use and would rather prefer to build off it. If I get to a point where my Rowhouses look nice enough, I might just submit my mod to the makers of Colonial Charter in hopes they will pick them up, credit me, and allow many people to enjoy my work. @AzemOcram you could certainly finish your mod and release it here on WoB; not everyone is playing CC. I have an update and with that update, I seek some advice. I now have 3DsMax 2012 (because 2012 version works with Cities XL as well) for students. Anyway, I was wondering whether I should have the windows be recessed into the wall, stick out of the wall, only have frames that stick out of the wall, or be flush with the wall? The lowest polygon count would come from windows that are flush with the wall and are entirely done with textures. The highest polygon count would either be recessed windows or framed windows but that is also the most realistic and good looking. Furthermore, there don't seem to be LOD's for these buildings, does that mean I should make my buildings low-polygon all the time? If these are to be the most commonly built housing in my games, would it be best for me to make these have super-low polygon counts? It should not be difficult to make these have less than 1000 polygons but if performance is hampered by 100+ of these, maybe I should try to keep these under 200 polygons, which might be more difficult (unless I utilize some texture tricks and don't make the details 3D. Does Banished support bump maps? If so, I could add the details of the windows and maybe even the doors with bump maps. The absolutely simplest 3D model I could go with tier 1 would be a rectangular prism with a pyramid (which would be a hipped roof) on top (and have all the windows and details be in the textures and maps) and a smaller rectangular prism or 2 for chimneys. The absolutely simplest 3D models for tier 3 and 4 would be be large rectangular prisms with 2 smaller rectangular prisms each for the chimneys. Tier 2 would have dormers so it would be similar to tier 1 but with the polygons from 2 extra rectangular prisms and triangular prisms, and possibly with a gabled roof instead of a hipped room. I have been playing around with 3DsMax for the past couple of days and went through all the tutorials so it is only a matter of time before I can make high quality models of the buildings I want but I don't know how complex the geometry should be. Furthermore, because my housing will require bricks, I will make my first version be a companion mod for CC but if some other modder, such as RedKetchup, adds bricks (and preferably glass as well) to the game, I could make another version that uses his brick mod. I plan on making the buildings have multiple upgrades (and these upgrades can require different resources from each-other, such that in the CC version, the base building would use logs, stone, and iron and the last upgrade would use bricks, glass, and joists). bah me i have my own way to do things, the way i m good at it. i dont care much about polygon, and i never delete unseen sides. too much complicated. i use metric in my 3dsmax. so if my hous has 4x4 , then it has 4 blocks of 1x1x.02 each side. Thank you for the feedback. I figured out how to make recessed doors and windows by subdividing the rectangular prism used to make the main portion of the houses and select a group of tiles on the front face then extruding them. After I got the right shape but before I optimized it, the first building I successfully made had almost a thousand triangles. 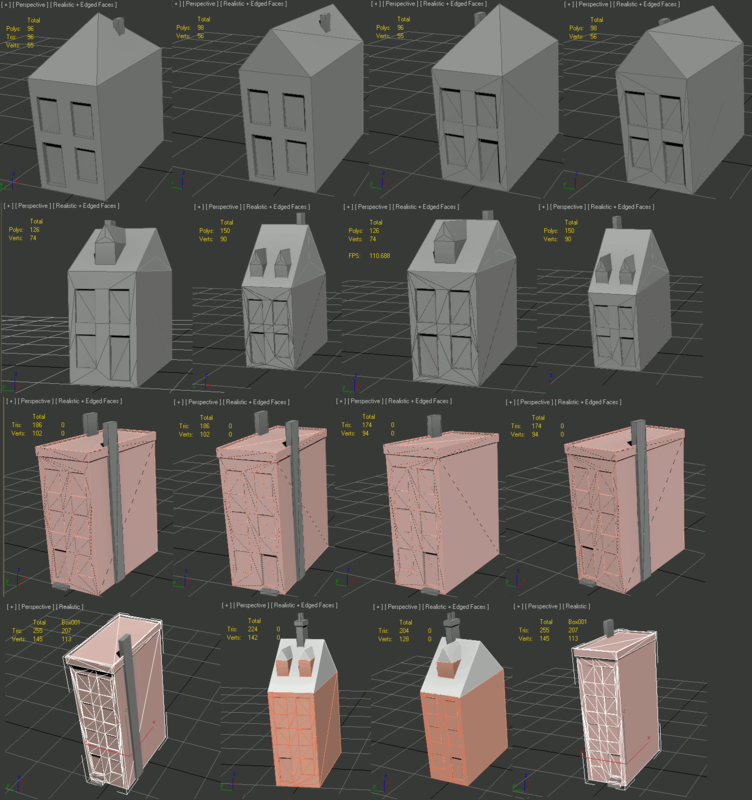 A picture of the two variations of the first tier rowhouses is below, showing their vertex and polygon counts. I am thinking about making 2 models per tier, each with 2 textures (one with the brick texture, one painted white) for a total of 4 variations. I might decide to go with 8 variations before completing the mod if I want to have grey brick, red brick, brown brick, and whitewashed brick. I will keep the number of variations the same for each tier (so they keep the same color scheme as they are upgraded) but it is possible that instead of 2 models with 4 different textures each, I might have 4 models with 2 different textures each (if I do this, then whitewashed brick rowhouses would have different models from brown brick rowhouses). However, I am getting ahead of myself. I am taking Organic Chemistry Class this quarter so I have other obligations. My mod, when released, will require a mod that adds bricks and glass. The first version of the mod will be a companion mod to Colonial Charter but if some other modders make mods that add bricks and glass, then I will release a version that does not require Colonial Charter. If I get enough positive feedback, I might release a 1 or 2 tier version of my mod made with logs, stone, and iron that uses stone textures and glass-less windows. Here are all the models I have made. The only work left to do now is texturing (each model will have 2 different color schemes and thus two different texture variations), making the models (and texturing) for the construction phases (I will make the same construction models for all of the variations of each tier, so I will only have to make 4 instead of 16) and turning it into a Banished mod. By mirroring the main building mesh, I managed to add variety easily and by making different textures (making sure to make windows and doors different styles/colors), I will have a good amount of variation. Please tell me if any of you think I should change or replace any of the building models. Hello. Very nice looking buildings. Can't wait 'til it's finished. When? question, all those house are for 1 family ?